Some 3.9 billion years ago in the heart of a distant galaxy, the intense tidal pull of a monster black hole shredded a star that passed too close. When X-rays produced in this event first reached Earth on March 28, 2011, they were detected by NASA’s Swift satellite, which notified astronomers around the world. Within days, scientists concluded that the outburst, now known as Swift J1644+57, represented both the tidal disruption of a star and the sudden flare-up of a previously inactive black hole. Now astronomers using archival observations from Swift, the European Space Agency’s (ESA) XMM-Newton observatory and the Japan-led Suzaku satellite have identified the reflections of X-ray flares erupting during the event. Led by Erin Kara, a postdoctoral researcher at NASA’s Goddard Space Flight Center in Greenbelt, Maryland, and the University of Maryland, College Park (UMCP), the team has used these light echoes, or reverberations, to map the flow of gas near a newly awakened black hole for the first time. 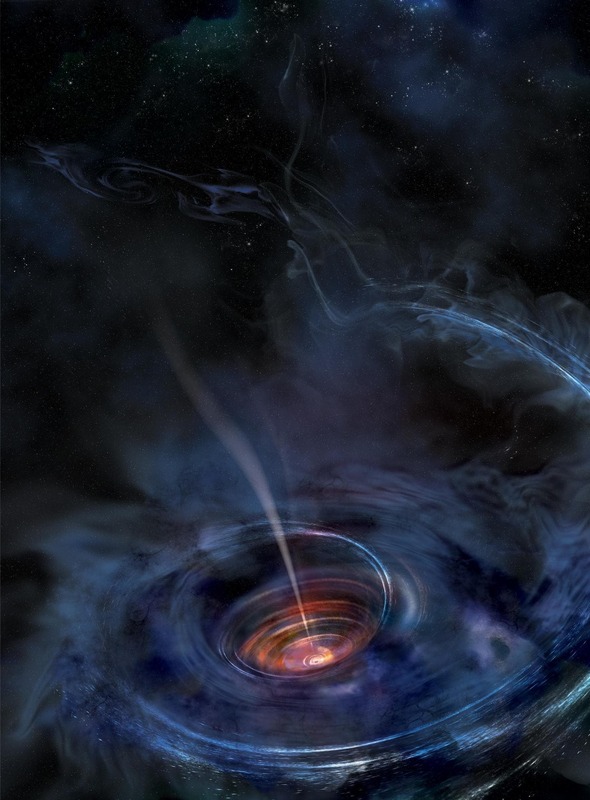 In the artist’s rendering below, a thick accretion disk has formed around a supermassive black hole following the tidal disruption of a star that wandered too close. Stellar debris has fallen toward the black hole and collected into a thick chaotic disk of hot gas. Flashes of X-ray light near the center of the disk result in light echoes that allow astronomers to map the structure of the funnel-like flow, revealing for the first time strong gravity effects around a normally quiescent black hole. Stellar debris falling toward a black hole collects into a rotating structure called an accretion disk. There the gas is compressed and heated to millions of degrees before it eventually spills over the black hole’s event horizon, the point beyond which nothing can escape and astronomers cannot observe. The Swift J1644+57 accretion disk was thicker, more turbulent and more chaotic than stable disks, which have had time to settle down into an orderly routine. The researchers present the findings in a paper published online in the journal Nature on Wed., June 22. One surprise from the study is that high-energy X-rays arise from the inner part of the disk. Astronomers had thought most of this emission originated from a narrow jet of particles accelerated to near the speed of light. In blazars, the most luminous galaxy class powered by supermassive black holes, jets produce most of the highest-energy emission. X-rays originating near the black hole excite iron ions in the whirling gas, causing them to fluoresce with a distinctive high-energy glow called iron K-line emission. As an X-ray flare brightens and fades, the gas follows in turn after a brief delay depending on its distance from the source. “Direct light from the flare has different properties than its echo, and we can detect reverberations by monitoring how the brightness changes across different X-ray energies,” said co-author Jon Miller, a professor of astronomy at the University of Michigan in Ann Arbor. Swift J1644+57 is one of only three tidal disruptions that have produced high-energy X-rays, and to date it remains the only event caught at the peak of this emission. These star shredding episodes briefly activate black holes astronomers wouldn’t otherwise know about. For every black hole now actively accreting gas and producing light, astronomers think nine others are dormant and dark. These quiescent black holes were active when the universe was younger, and they played an important role in how galaxies evolved. 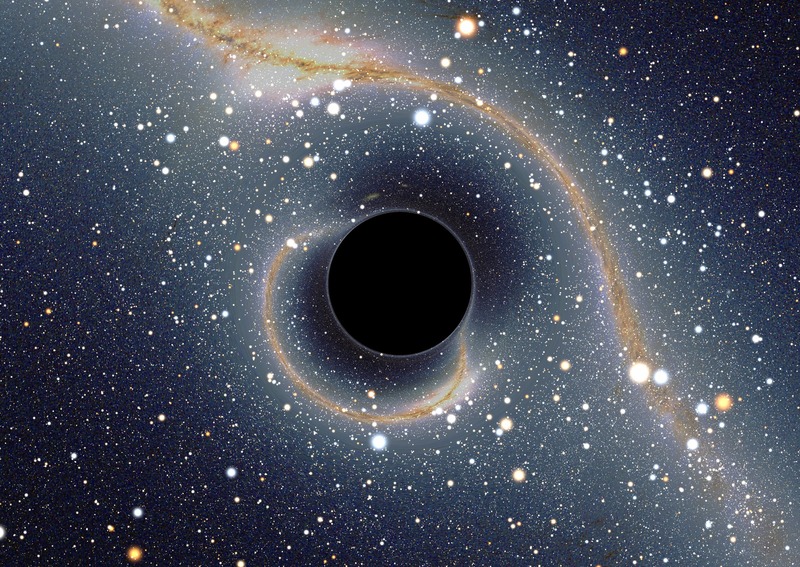 Tidal disruptions therefore offer a glimpse of the silent majority of supersized black holes. The researchers estimate the mass of the Swift J1644+57 black hole at about a million times that of the sun but did not measure its spin. With future improvements in understanding and modeling accretion flows, the team thinks it may be possible to do so. ESA’s XMM-Newton satellite was launched in December 1999 from Kourou, French Guiana. NASA funded elements of the XMM-Newton instrument package and provides the NASA Guest Observer Facility at Goddard, which supports use of the observatory by U.S. astronomers. Suzaku operated from July 2005 to August 2015 and was developed at the Japanese Institute of Space and Astronautical Science, which is part of the Japan Aerospace Exploration Agency, in collaboration with NASA and other Japanese and U.S. institutions. NASA’s Swift satellite was launched in November 2004 and is managed by Goddard. It is operated in collaboration with Pennsylvania State University in University Park, the Los Alamos National Laboratory in New Mexico, and Orbital Sciences Corp. in Dulles, Virginia, with international collaborators in the U.K., Italy, Germany and Japan.